Safavieh En Vogue Dining Carrie Polyester Dining Chairs (Set of 2) - 19.5" x 24.2" x 33.4"
Safavieh En Vogue Dining Carrie Taupe Linen Dining Chairs (Set of 2) - 19.5" x 24.2" x 33.4"
Safavieh Sinclair Beige Ring Chairs (Set of 2) - 19.5" x 24.2" x 33.4"
Safavieh En Vogue Dining Carrie Charcoal Grey Dining Chairs (Set of 2) - 19.5" x 24.2" x 33.4"
The bent back of this set of two dining chairs gets a classic dressed-up punch thanks to exposed nail heads and cleaver silver ring detail. Button tufts on the front of the tapered backrest complete smoke upholstery and espresso legs. I purchased these chairs rather uncertain how I would like them as I had never purchased from this site before. Would they be true to color? What kind of quality would they have? Will they match my décor? When the chairs arrived they were days earlier than anticipated, and they were GORGEOUS!!!! I have received several compliments and am thrilled to have these as part of my dining room. The silver handle of the back is super classy and the buttons add just thr right amount of elegance. I loved the two I order that I had to have two more! If you are looking for stylish and sophisticated seating that is both sturdy and feminine, I strongly suggest these chairs. They're great for a complete dining set or as accents in the living room. You seriously cannot go wrong here! 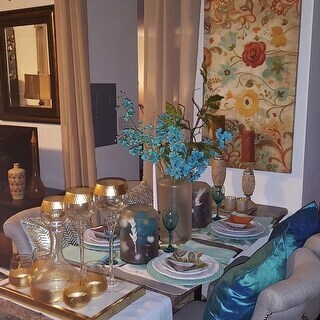 Perfect for our dining room. To bad we only use this table only twice a year :-). 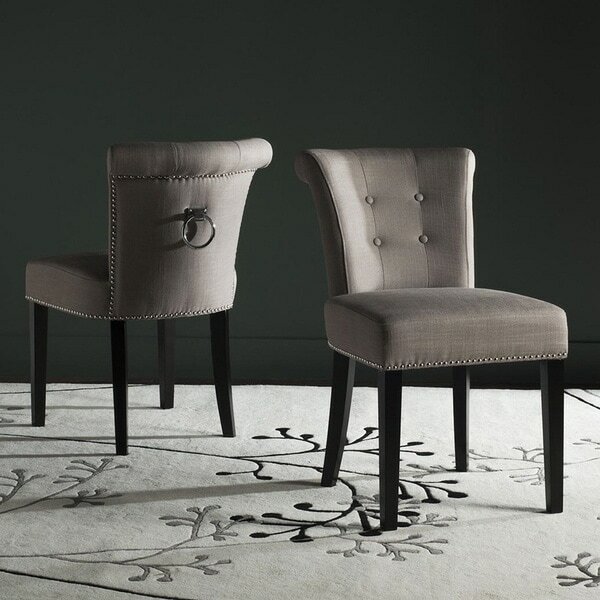 Do not hesitate to buy these chairs they are very elegang and are worth far greater than the price! Packageing is excellent! I absolutely love my chairs i purchadefd two sets! These chairs are perfect for our dining room. They are very easy to assemble and well made. Highly recommended item! Great quality! Chairs look just as shown in picture and very easy to assemble. This is the most adorable little chair that I purchased for my bedroom vanity table. It's so beautiful I am considering the same set of chairs for my dining room. Gorgeous chairs BUT they are a little on the small side. They are very short! 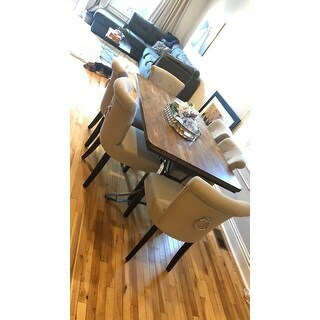 We ordered 4 chairs for my large round dining table and we will definitely need two more, but not these, probably two larger ones to even it out. I only use 4 chairs but apparently they have been bigger than these. Also as others have stated, they are a very LIGHT gray. They actually look like a light taupe or something but not gray. But it is still a very beautiful color. Very neutral. Gorgeous detail with the large ring on the back and silver nailhead trim. Also, my screws were stripped and we are missing to washers for the screws. Hopefully they can send us some extras. Overall......great and I would still recommend them. 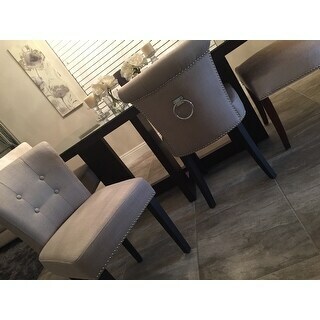 The Safavieh En Vogue Dining Sinclair Smoke Nailhead Ring Chairs are beautiful chairs and they are well made. However, the smoke color was lighter appearance than online. Great choice at a good price! Amazing chairs, super comfortable, elegant. I get compliments all the time, even my daugther got a set of 6 for her brand new home, and she gets complimented all the time, "Great Purchase"
Shipped really fast - appreciate that. Color is a bit lighter than pictured. Look very elegant with the silver tacking and ring. I placed them around my dining room table. Looks fab. Legs are very dark espresso and compliment the color of the fabric. These chairs are absolutely beautiful!! Love them! I love the chairs , wish they where taller but there still very classy . Chairs are absolutely beautiful. Also very comfy and sturdy. I have had them for over a year and they have held up well in our dining room. Would highly recommend them. 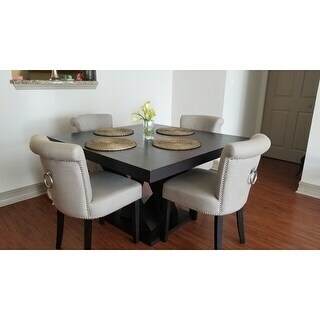 Love the look of these chair, brought four for dinning room tables. They are very, very light, if you walk by them they will fall over. I kept them because I liked the look. Love it! Everything as described! Absolutely love these chairs. They look expensive but the price was great. They are a little lighter gray than the picture but still works for me. I love this chair we ordered 4 of them came early and very well packaged, they are very well made and easy to put together. Looks so rich in my kitchen love it. Much lighter in color than pictured. Smaller sized but elegant. These chairs looks great! Love the quality and the look. Product is great, had them for couple years and they are amazing. I would recommend them. Gorgeous set of chairs that was more than worth the money. Beautiful grey color. 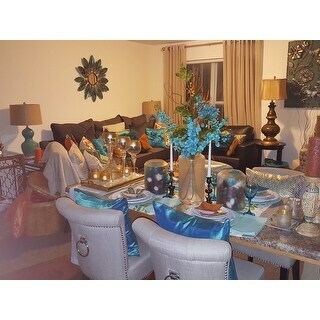 I paired it with a dining table I also got from overstock. Very satisfied. "Hello can the legs be removed?" Yes, the legs do not come attached to the chair. "What is the weight capacity of these chairs"
The seat height is 20.7 inches. 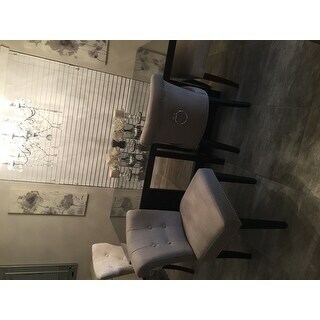 I chose this product because Safavieh is a reputable furniture company and I have purchased many items from them in the past. These chairs are not so bulky and I wanted the ring back chair. I have a small dining room area and did not want it cluttered with large chairs. "could you be more clear about the color of these chairs. Are they a light gray? And are the legs espresso (black)"
These chairs appear to be a light taupe color, and the legs are black. "In your opinion, do these chairs more closely match the photo in the room, or the photos on the white background? They are two different colors. I'm trying to figure out if they pull more towards gray or beige. Also, has anyone compared them to the "cream" chairs, which reviewers say look more gray/tan. This is getting confusing! Thanks!" The photos on the white background are a more accurate representation of the color of these chairs. In my opinion, the chairs are more closely matched to the white background. "Is Smoke a lighter shade of the grey or more cream?" Safavieh En Vogue Dining Sinclair Antique Brown Bonded Leather Ring Chairs (Set of 2) - 19.5" x 24.2" x 33.4"